Size 8 or 9 (which ever gives the correct guage) circular and set of double point needles. Cast on 110 stitches, place marker at beginning of row. Repeat Row 18 until hat measures 6"
Cut yarn leaving a 10 tail. Thread through remaining stitches and finish off. 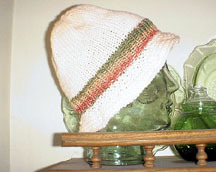 This hat looks especially nice with the ribbing done in a contrasting yarn.